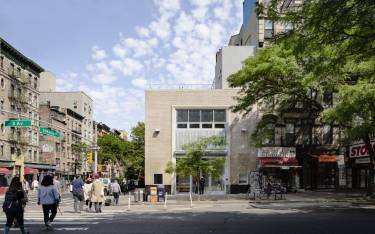 The 4-story building contains 7,500 sf of gallery spaces for exhibitions and open programming, a library, flexible spaces for open programming, a Printed Matter bookstore, and a roof terrace and garden which features site-specific installations and enjoys views of the neighborhood and beyond. Facilities and programs are also made more accessible through open floorplans, a new additional staircase, and an elevator. 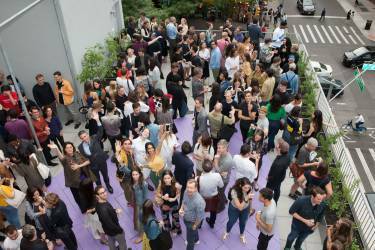 We are proud to have collaborated on this incredible project with the Swiss Institute to realize their vision of a permanent space for display and engagement. The architecture of 38 St. Marks Pl is celebrated by SI ONSITE, a series where semi-permanent art installations intervene directly into the building in non-gallery spaces and makes visible the un(der)recognized architectural components of a building. Architecture is seamlessly appropriated in artworks such as John Armeleder’s Royal Flush, a floor-to-ceiling flattened disco ball doubling as a wall in the reception area, Jill Mulleady’s hand-painted silk curtains in the SI library, or the color palette for the elevator’s interior selected by the artist Pamela Rosenkranz, who chose Memorable Rose for its resemblance of the color of a human tongue. This dialogue between architecture and art shifts the usual hierarchy, integrating art in the daily life of the building with scents, plants, murals, clothing, seating, and a visitor survey. READYMADES BELONG TO EVERYONE is on view through August 19, 2018. 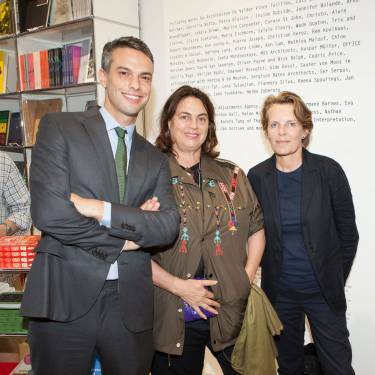 Swiss Institute is an independent non-profit contemporary art institution dedicated to promoting forward-thinking and experimental art marking through innovative exhibitions and programs. Learn more about SI and the building here.